Infanta Antónia of Portugal (or of Braganza; Portuguese pronunciation: [ɐ̃ˈtɔniɐ]; Antónia María Fernanda Micaela Gabriela Rafaela Francisca de Assis Ana Gonzaga Silvéria Júlia Augusta de Saxe-Coburgo e Bragança; 17 February 1845 – 27 December 1913) was a Portuguese infanta (princess) of the House of Braganza, daughter of Queen Maria II of Portugal and her King consort Ferdinand II of Portugal. 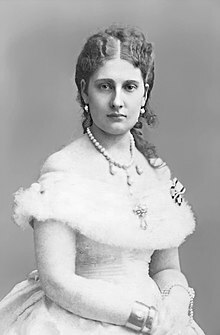 Through her father, she also held the titles of Princess of Saxe-Coburg and Gotha and Duchess of Saxony. Antónia of Braganza died in the German Empire in 1913.